Pleading the Sixth: On June 17, 2016, the New York Assembly passed a bill requiring full state funding of indigent defense services, after the Senate passed the measure the previous night. Will Governor Cuomo sign it into law? 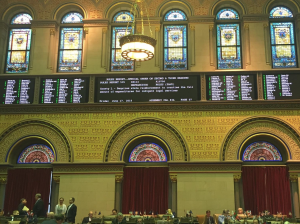 On June 17, 2016, the New York State Assembly unanimously passed A10706 requiring the state to take over responsibility for all funding of the right to counsel for indigent people. The Senate unanimously passed a similar bill (S08144) the previous night. Now the law goes to the Governor for signature. Though it is anyone’s guess whether Governor Cuomo will sign or veto the law, with unanimous support out of both houses, state responsibility for funding the right to counsel in New York should be veto-proof. Historically, New York’s counties have been responsible for providing and funding the cost of defending indigent people. Under the new legislation, the state will reimburse its counties and New York City for “[a]ll expenses for providing counsel and services other than counsel,” phased in over seven years; 25% in 2017; 35% in 2018; 45% in 2019; 55% in 2020; 65% in 2021; 75% in 2022; and full reimbursement as of April 1, 2023 and every year after. In 2010, the legislature created the Office of Indigent Legal Services (ILS) as a state level agency and gave it limited authority to gather statewide information about provision of right to counsel services, to make recommendations to improve the delivery of services, and to distribute limited state funds to counties to improve the quality of services. The ILS distributed state funds in three ways: (i) “non-discretionary distributions” to all counties in percentages established by the legislature, with this funding scheduled to end in 2015; (ii) “discretionary distributions” to all counties for quality enhancement to help counties achieve recommended standards; and (iii) competitive grants awarded to counties that were developing innovative solutions to specific needs or shortcomings in indigent defense services. While there are countless New York advocates to be thanked that have tirelessly worked for decades to get the state of New York to meet its constitutional obligation to ensure that the indigent accused are provided effective representation at all critical stages of criminal proceedings, the passage of the new legislation is also a validation of the U.S. Department of Justice (DOJ) continued focus on America’s indigent defense crisis. For it was DOJ’s Statement of Interest in Hurrell-Harring that established that a court does not have to wait for a case to be disposed of and then try to unravel retrospectively whether a specific defendant’s representation met the aims of the Sixth Amendment. As DOJ made clear, if state or local governments create structural impediments that make the appointment of counsel “superficial” to the point of “non-representation,” a court can step in and presume prospectively that the representation is ineffective. Enumerating a number of such structural impediments (e.g., “a severe lack of resources;” “unreasonably high caseloads;” “critical understaffing of public defender offices;” and/or anything else making the “traditional markers of representation” go unmet) very well may have been the critical event that made the state settle the lawsuit, and set in motion the events leading to the passage of the new legislation.